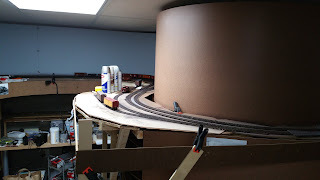 Randy's Layout Blog: But wait! There's more! So part of what I've been doing over the last few weeks is reorganizing much of my research. Part of the purpose of my site was originally to provide a location for me to store information that I've researched so I could find it again. Over time I've been a bit lax, plus there are a lot of things that I'm not quite ready to post for public consumption. 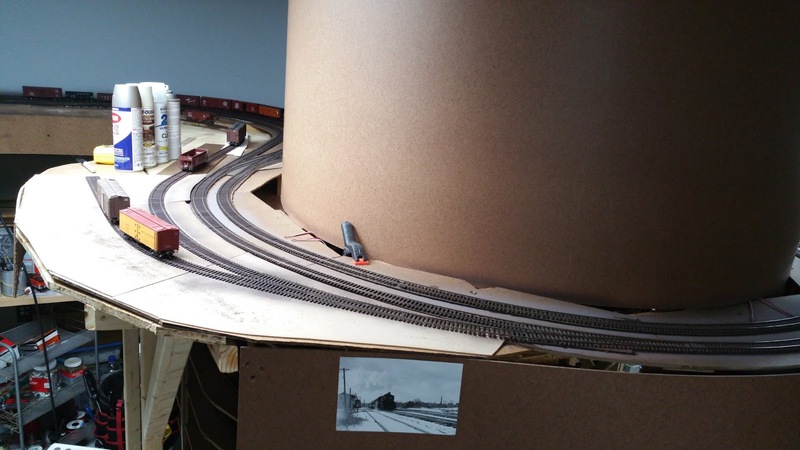 Anyway, last year I had made some modifications to the layout initially out of necessity, but found that it would also allow me to include a few things I thought I couldn't. Originally there was a mix of industries from this area, the Berlin Line, and one New Britain industry (Cremo Brewery) from the Springfield Line. They were located in a freelanced industrial area on top of the helix. In the end it felt very 'model railroady' to me, and so when I had to adjust the helix to bring a few grades on the layout down, they were not rebuilt. Instead I found I was able to add several of those industries, in their prototypical location, on the layout proper. There were a few additional sidings added later. The three farthest sidings were Stanley & Svea Grain & Coal (on the grade); Cohen William, grocery wholesaler; RM Hall General Store warehouse; and Carlson & Torrell Building Supplies. The tank cars are sitting on sidings for Texaco and Atlantic Refining (they did share a double siding), and the curved track to the right was Cremo Brewery. Starting from the first siding closest to us: Cohen & William and RM Hall. On the longer siding is a mock up of the Household Fuel Company, just beyond that is Carlson & Torrell, and then the Stanley Svea trestle. Barely visible across from the coal silos is a turnout that is a small siding for North & Judd, something that was missing from the old arrangement. Originally I thought Carlson & Torrell wouldn't fit, but as it turns out it should work in the space. There is the possibility that there is one more industry on the RM Hall/Cohen William siding. I need to make a trip to the library to verify what was there at this time, but Wellin's Auto Parts may have been there as well, or might have replaced one of the other ones. There is enough room to add it if needed, although the two industries fit a bit better and will allow me to expand the footprint of Household Fuel. Anyway, as I revisit the research, I was reminded of a couple of things. 1) I had added the oil dealers to the top of the helix because I wanted to have someplace to delivery plain black gasoline and/or oil tank cars. 2) The Atlantic Refining/Texaco siding was a trailing point siding on the east-bound main. Mocking up benchwork for that location I find that not only can I fit it, but it's in the correct location and has enough real estate to model it. Switching the siding might be a little tight with the Stanley Works crew in the area, but then I remembered that the crew did use that portion of the helix during the last operating session anyway. So by adding the corner back in I'll have room for two additional consignees, and they'll be receiving a class of cars that is otherwise unrepresented on the layout (other than through trains). Even better, it's prototypically located, other than missing a half-mile of connecting track. So I'm excited that I will be able to fit in three additional industries without excessive crowding, and in a prototypical manner. Even better, it adds another class of freight car that will regularly visit the layout. Atlantic Refining as a former Standard Oil Company will receive primarily black UTLX tank cars, and Texaco also usually receives black tank cars, either TCX or GATX, with an occasional (and very dirty) aluminum tank car with billboard lettering. So a nice contrast there. On the Berlin Line I'll be able to add the two dealers there as well - Gulf and Socony-Vacuum. Gulf also receives black tank cars, occasionally with a Gulf herald on them. But Socony-Vacuum has their highly visible fleet of red Mobilgas tank cars that will add quite a bit of interest.